Let me tell you a sad story about a girl who has too many books and not enough place to put them all. I call it The Story of My Life. Despite the large percentage of my books that currently live in my parent’s basement in Michigan, I have recently reached capacity for my 3 sizable Boston bookshelves. I didn’t even ask for any books for Christmas this year because I knew I wouldn’t have anywhere to put them, and I wouldn’t have any time to read them. I told you! This is a SAD story, don’t you think? A year and a half ago, my pal Jules over at Pancakes & French Fries challenged herself to finishing what she calls The Unread Library that takes up shelf space in her own home. I found this project intriguing, but I’m not sure I could ever make the commitment she has made – to not buy a single book before finishing off those abandoned titles. First of all, I have so many unread books, it would probably take me over a year to complete this task. Being that I only buy 3-4 books a year anyway, I would consider the exercise somewhat masochistic – why torture myself when my input is so low anyway? I think a more effective tactic would be for me to freeze my library card in a hunk of ice until I finish them all… but watching Jules make steady progress on her stack of books is motivating, nonetheless. I’d like to at least document my own Unread Library here, so in July when I am packing up my life into cardboard boxes, I will at least be aware of what books I’ve decided to take with me onto my next life-destination. 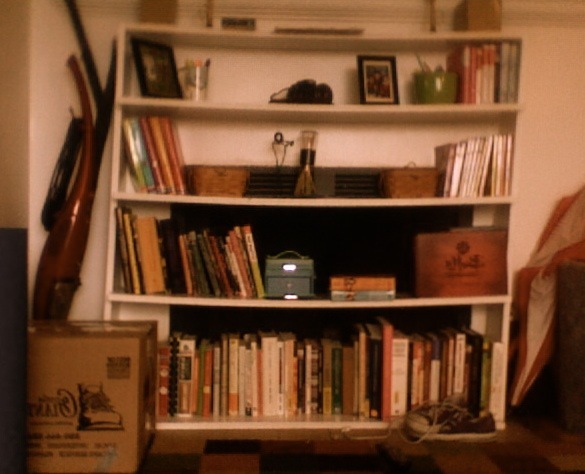 Also: please pity my poor, can’t-stand-upright, sway-shelved bookshelf. P.S. I am fairly sure than when Jules posted her list, I laughed at it’s dainty nature. However, now that I have compiled this list fully, I see that we are exactly evenly matched. Although I am willing to place bets that my own Book to Square Foot of Real Estate ratio is much, much higher. I can’t escape them. They are everywhere. I have a bunch of books in my parents’ basement as well, and I’m also out of room in my tiny apartment, but I continue on recklessly! If I ever disappear, please tell someone I’m probably trapped under my books.